Welcome to our practice! At 20/20 Vision Care we provide expert, professional service in a friendly and inviting atmosphere. We have two locations to serve you in Arnold and Ballwin Missouri. Services that Dr. Lewis provides include complete eye health and vision exams, diagnosis and treatment of eye disease, including glaucoma, macular degeneration, diabetes and dry eyes. She has extensive experience prescribing eyewear and contact lenses for patients of all ages. This includes single vision, bifocals, progressives, sunglasses and safety/occupational eyewear. The staff at 20/20 Vision Care focus on exceptional, individualized service. 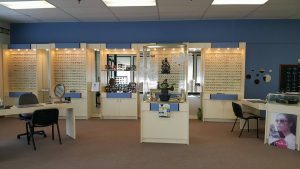 20/20 Vision Care is your full service location for eyeglasses and contact lenses. Call us today to schedule an appointment or stop in to view our selection of designer frames.